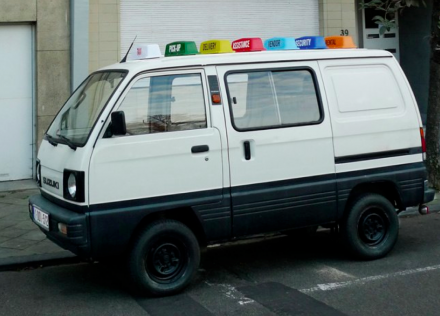 The signs on the small van describe the services it supports: Taxi; Pick-up; Delivery; Assistance; Vendor; Security; Rental. Seven functions, one vehicle. 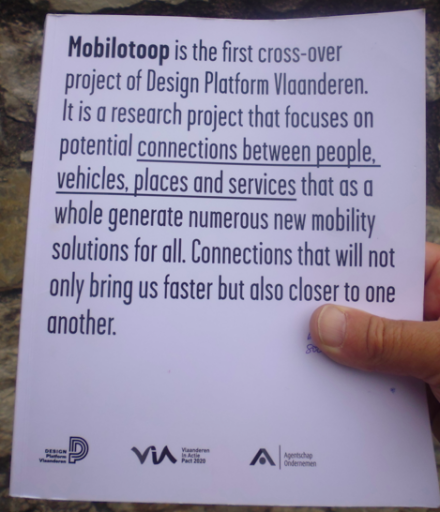 As imagined in a project in Belgium called Mobilotoop the van, when coupled with a pay-per-use leasing framework, and radically distributed computing, becomes an element within an asset-light mobility ecosystem. Mobilotoop asks, ‘how will we move in the city of the future?’ – and does not worry too much about the design of vehicles. ‘Cloud commuting’, in this context, is about accessing the means to move when they are needed (such as the micro-van, above) rather than owning a large heavy artefact (such as a Tesla) that will sit unused for 95 percent of the time. 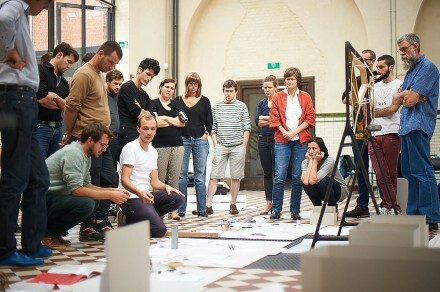 The first cross-over project of Design Platform Vlaanderen, this two year research project focuses on potential connections between people, vehicles, places and services that – as a single ecosystem – generates new mobility solutions dynamically, and continuously. 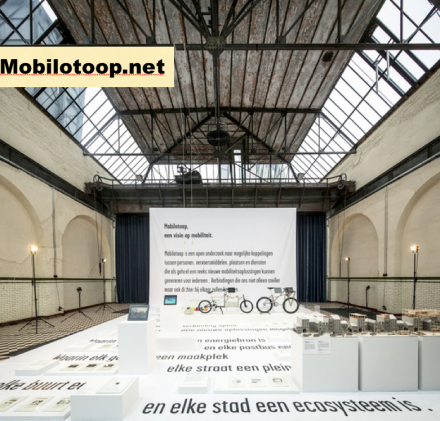 With a focus on connections that bring us not just faster but also closer to one another, Mobilotoop is about a system that enables new relationships between people, goods, energy, equipment, spaces, and value. This may all sound abstract, but Mobilotoop is way of thinking whose time has come. Economics, more than green thinking on its own, will drive the transformation from here on. Until now, we’ve moved ourselves – and stuff – about the city in ridiculously wasteful ways. A snapshot from The Netherlands: of the 1,900 vans and trucks enter the small city of Breda each day, 90 percent of those deliveries could be done by bike, or e-bike. Once all system costs are included, a cargo cycle can be up to 98 percent cheaper per km than four-wheeled, motorised alternatives that now clog our roads. Mobilotoop envisions a mobility culture in which every ride is an encounter, every traveller an entrepreneur. Mobile media, flexible vehicle designs, and adaptive infrastructure, enable everyone to be a user and a supplier of mobility services. Every commuter can deliver a package on her way to work. Every walker might collect sensor data about the quality of the sidewalk surface, or the air. The electric motor on a pedelec might be used to drive a balcony hoist. 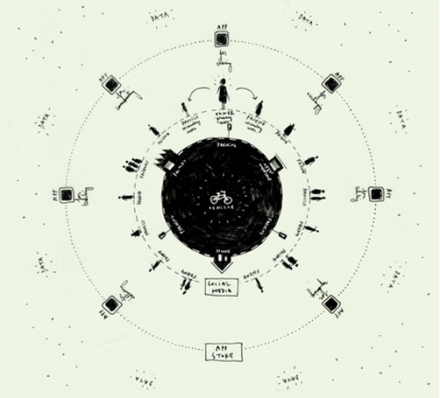 In Mobilotoop’s imagination, radically adaptive use is not only about cash transactions. A borrowed vehicle properly used and returned – or a service well-executed – adds to your reputation as a sharer. This enhanced reputation gives you access to use credits, discounts on services, or the use of other vehicles, equipment, and workplaces. This entry was posted in mobility & design, most read. Bookmark the permalink. Post a comment or leave a trackback: Trackback URL.